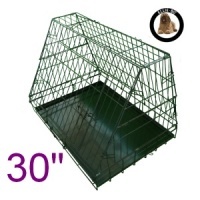 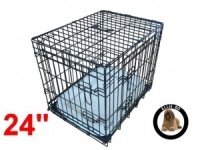 Ellie-Bo dog cages are quick and easy to assemble and dismantle. Their folding design and carry handle make our cages ideal for storage and easy to transport. 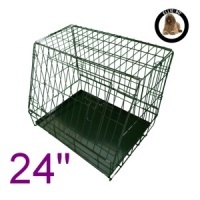 All of our cages have two doors, one on the front and one to the side with secure latch mechanisms, this enables easy access and exit. Every cage has a removable metal tray that sits on the bottom of the cage and can act as a base for your pets bedding. 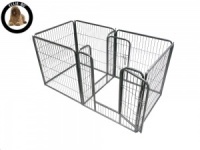 Unlike plastic trays our trays will not split and cannot be chewed therefore lasting longer. 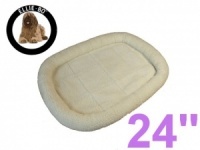 A cosy faux sheepskin bed is included with the deluxe cage range and with its raised sides provides extra comfort. 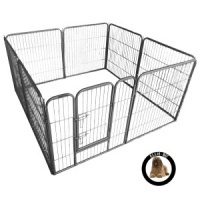 Finally the wire construction provides all round visibility and ventilation for your pet, giving your dog a sense of security within its surroundings. 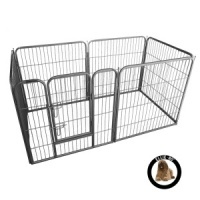 We have recently extended our range of quality pet products to include puppy pens and dog bedding. 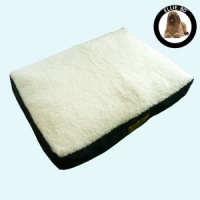 All have been designed in house and only use the best quality materials. 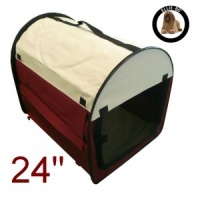 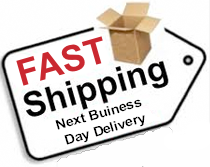 We hope that your pet will enjoy our value for money high quality items and appreciate your continued support.